Fleet Complete, in a joint venture with SEG Racing Academy in the Netherlands, launched the Fleet Complete Cycling Academy based in Loutraki, Greece. The launch of this new youth initiative will help inspire, develop and strengthen the future of young Greek cyclists. TORONTO, Feb. 26, 2019 /PRNewswire/ - "At Fleet Complete, we believe in innovation and people in the field of mobility in all its forms. This is why we are so proud to launch the Fleet Complete Cycling Academy in Loutraki with the hope of developing the future of professional cycling in Greece," says Tony Lourakis, CEO of Fleet Complete. "We want to provide a rare opportunity that will help unleash the potential of young Greek athletes, aspiring to be successful in the Classics or Grand Tours." 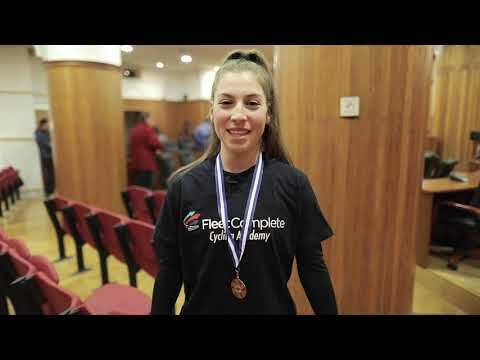 VIDEO: Fleet Complete launches Greece's first Cycling Academy in Loutraki for young riders who aspire to go professional. The Fleet Complete Cycling Academy is working together with the SEG Racing Academy in the Netherlands, who are the best development team in the world rankings today. In the last four years, 12 young riders moved professional after graduating from the development program. SEG Racing Academy will be responsible for administrating and developing young talents from junior to U23 level. "We are excited to expand the blueprint of our successful Racing Academy to a new dimension," says Bart van Haaren, SEG Racing Academy Manager and UCI licensed rider agent. "Fleet Complete Cycling Academy (which will be led by Vasilis Anastopoulous) will focus on the Greek youth, and will provide some of the biggest Greek talents with the tools to further develop themselves. Since our inception, SEG Racing Academy has a strong bond with Greece. For the last 5 years, our riders spent the wintertime in the region of Loutraki in order to prepare for the season. It's great that we can start this ambitious project together with Fleet Complete." The academy's training grounds are located in Loutraki, the region of Corinth in Greece. It will provide young Greek riders with a high-standard training venue, outfitted for professional cycling in Europe and preparing the athletes of tomorrow with the right education. "Many young athletes show great talent in cycling, but might never manage to move to the next stage because they are unable to compete internationally," adds Lourakis. "Unless you have the opportunity to participate in an international race, it is very difficult to assess the needs of a professional cyclist. Fleet Complete Cycling Academy will provide young Greek athletes with the right professional support and the proper framework to compete on an international scale." The Fleet Complete Cycling Academy will start a 2-year process of choosing the right candidates in cooperation with cycling clubs across Greece and form a 4-person team that will train, develop and eventually compete in international races. Aspiring candidates can now apply through the academy website. For more images from the inaugural event, please click here. To view the launch video on YouTube, please click here. Fleet Complete® is a leading global provider of connected vehicle technology, delivering mission-critical fleet, asset and mobile workforce management solutions. The company is servicing close to 500,000 subscribers and over 30,000 businesses in Canada, the U.S., Mexico, Australia, the Netherlands, Belgium, Luxemburg, Austria, Germany, Denmark, Sweden, Finland, Norway, Estonia, Latvia and Lithuania. It maintains omni-channel partnerships and distribution with AT&T in the U.S., TELUS in Canada, Telstra in Australia, and Deutsche Telekom (T-Mobile) in multiple European countries. Fleet Complete is one of the fastest-growing companies globally, having won numerous awards for innovation and growth. For more information, please visit fleetcomplete.com.